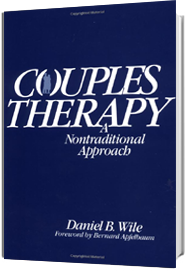 As described in previous blog entries, doubling, originally devised by Jacob Moreno, is the featured method in Collaborative Couple Therapy. I speak as if I were one of the partners talking to the other. A colleague, Dorothy Kaufmann, pointed out that “acknowledgement” is crucial in doubling. 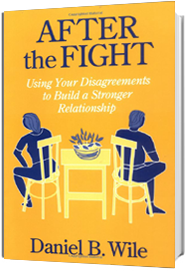 People in a fight rarely acknowledge anything the other person says or consider their own role in the problem. When I double for them, I do the acknowledging for them. How do I come up with acknowledgments that the person for whom I’m speaking might accept? More than one feeling. One way is to recognize that what’s said in anger typically isn’t the person’s only belief or feeling about the matter. Ralph angrily criticizes his wife Sue for their eight year old daughter Ronny’s social and behavior difficulties in school. In previous sessions, he attributed these difficulties to his failings as a father. Dan (doubling for Ralph talking to Sue): I shift back and forth between blaming you for Ronny’s difficulties and blaming myself—and as you can see at the moment, I’m deeply into blaming you. It’s painful to see the problems Ronny has and feel so powerless to help. Ralph might not like my reminding him how he previously blamed himself. He might want to put the responsibility on Sue. On the other hand, he might welcome the opportunity to shift to this more philosophic appreciation of his and Sue’s mutual struggle and their heartbreak over Ronny’s difficulties. Sam (to Alan): You know, you’ve got a problem with social anxiety. You ought to check it out. You never want to go anywhere, do anything, or meet anyone new. Alan: You’re the one with the problem. You’re not happy if you’re not always on the move and doing something new. It wouldn’t hurt to spend a night home once in a while. Dan (to both partners): Is there something to what I’m saying or am I minimizing the issue or missing the point? What partners don’t say. It is possible at times to find acknowledgement in what partners don’t say, that is, what they leave out. Linda: I can’t stand how you’re always late. I’m tired of having to wait around for you. Ellen: And I’m tired of all the things you buy that we don’t need. Ellen’s response has little to do with what Linda just said. It is a non sequitur. Instead of insisting that she isn’t always so late, Ellen makes a counteraccusation, complaining about Linda’s buying habits. It’s as if Ellen is saying, “You’re not so perfect either.” By not denying being habitually late, Ellen implicitly acknowledges that she is. I make it explicit. Dan (speaking as Ellen talking to Linda): “Linda, you right about my lateness. I need to work on it, although it’s hard to change. It’s been such a pattern in my life. I feel bad about it so I want to point out that you have faults too. I’ve turned Ellen’s argumentative statement into a confiding one in which she brings Linda in on her (Ellen’s) thinking about the matter. I make a guess about the train of thought that might have led to her statement, basing my speculations upon what I’ve learned about her in previous sessions. Turning an accusation by one partner into an acknowledgment by the other. 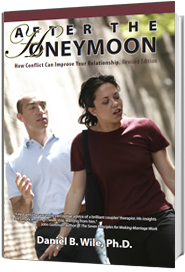 When a partner accuses the other partner of something, I store it in my mind and look for an opportunity to recast it as an acknowledgment on behalf of the other. Sondra (to Brian): Do you have to keep holding onto that? Sure, I dated him, but that was long ago—way before we had any kind of commitment. Later in the session, I return to Sondra’s comment. But I take the words out of her mouth and put them into Brian’s. Said by Sondra, these words are an accusation; said by Brian, they’re an acknowledgment. If I’ve picked the right moment and way to make this comment, Brian might welcome it and even build upon it. Brian: It’s my own fault. I shouldn’t have been so slow to make a commitment. Disarmed by Brian’s acknowledgment, Sondra may find herself automatically making one of her own. Sondra: Still, I shouldn’t have dated him. Brian: I appreciate your saying that. When partners are in a collaborative cycle, they often spontaneously acknowledge what in the adversarial cycle they grimly refuted. I scan each partner’s comments looking for opportunities to make acknowledgments in their behalf. I guess what types of acknowledgments they might accept based on what I know about them. I bring up acknowledgments they made in the past, realize that what they say in anger typically isn’t their whole view of the matter, change their statements about right and wrong to that of differences and preferences, and pay attention to what they don’t say as well as what they do say. Whenever I can, I recast accusations by one partner into acknowledgments by the other. Dan: Another great blog. I really love your specific suggestions for what to say. For my money, “acknowledgment” is key and fits with two key psychodynamic ideas. The first comes from modern self psychology which emphasizes the value of “validation” and “empathy” as ways to cool things down and move ahead. The second is still more basic, that you are speaking the deeper, more hidden, more vulnerable, more defended things that are just below the surface. One neat thing you do is point out that the OTHER person is often saying what the first person hasn’t quite acknowledged as true. I also loved your suggestion on what to do when the person defends by pointing out an unrelated fault (technically termed “cross-complaining”). ; you don’t just point out the non sequitur, you get at the why of why the person might have said that. You are such a master and I keep trying to channel you daily! Keep it up. I’ll forward this blog to colleagues. many different struggles. A joy to read. I’m impressed how you sort out what could seem like a whirling mishmash of attack and defense into specific and well defined options for intervening. So clear and learnable. Dan, I really enjoyed reading the new blog. I love doing “doubling” and now have a word to describe what I do! It speeds up the process of communication so much. Thank you for another great blog. For me, the grand prize statement is “when partners are in a collaborative cycle, they often spontaneously acknowledge what in the adversarial cycle they are grimly refuting.” You remind us that acknowledgments help partners (to paraphrase you) make the shift from disapproval to empathy and to transition to an admitting-admitting, confiding-confiding, making-each-other’s-points cycle. I try to remember that an intimate conversation is often just a sentence away, and to continually ask myself: “what is that sentence?” You remind us that acknowledgements are yet another tool for finding the conversation hidden in the argument.